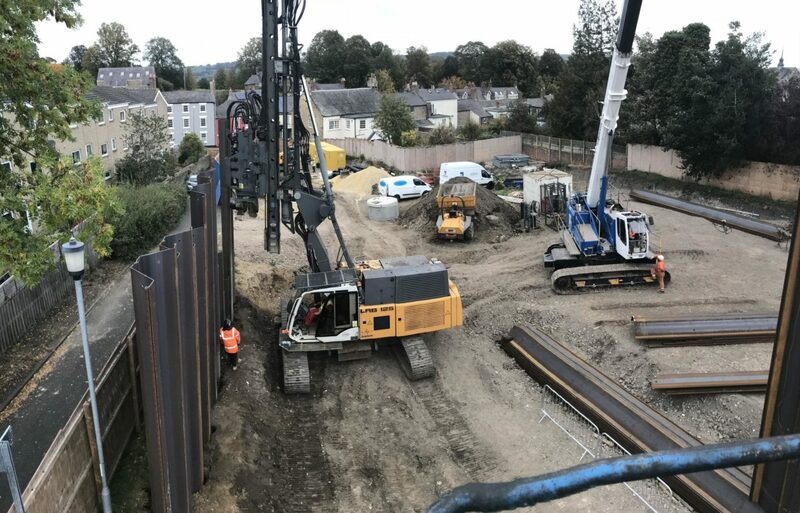 Aarsleff Ground Engineering were awarded the contract to install approximately 200lin/m of sheet piles for a new residential development on St. Cuthberts Close in Hexham by main contractor Tolent, who are working on behalf of the client Karbon Homes. The £5m development will consist of 38 high specification flats for older residents. The development will replace the former sheltered housing which was built in the 1970’s, providing modern one and two bedroomed apartments. Aarsleff installed a range of AZ & GU sheet piles around the site perimeter to create a wall of up to 3.7m retained height. Aarsleff pre-augered specific areas of the site before installing piles, providing a less obstructive drive and minimal vibraton levels for nearby houses. AGE utilised a telescopic leader rig with a high frequency vibratory driver along with a 50-tonne crawler crane to offload the piles and service the rig.